Midlothian Code is a local Virginia nonprofit organization that reaches out to those learning a programming language or seeking mentoring and networking. Their mission is to educate and empower local people to achieve careers in technology and improve their lives. 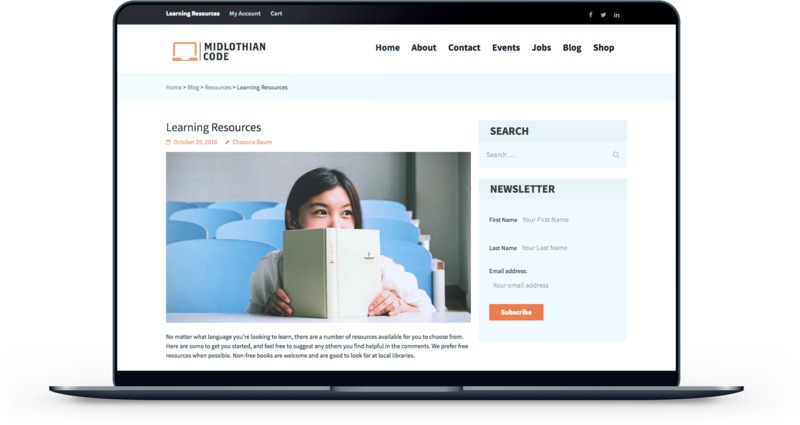 Founded in 2016, Midlothian Code runs educational events for current and aspiring programmers out of local libraries and other public venues. They have held 13 such events to date. Midlothian Code needed to establish a brand and a digital presence, with the primary goal of increasing awareness of its events. Secondary goals included making learning resources easy to access, setting up a structure for local job listings and providing a means of financial support. To conserve the organization’s limited time and finances, I created a WordPress website and integrated The Events Calendar to streamline event management. The Events Calendar was created by Modern Tribe, and is the leader in event plugins for WordPress. 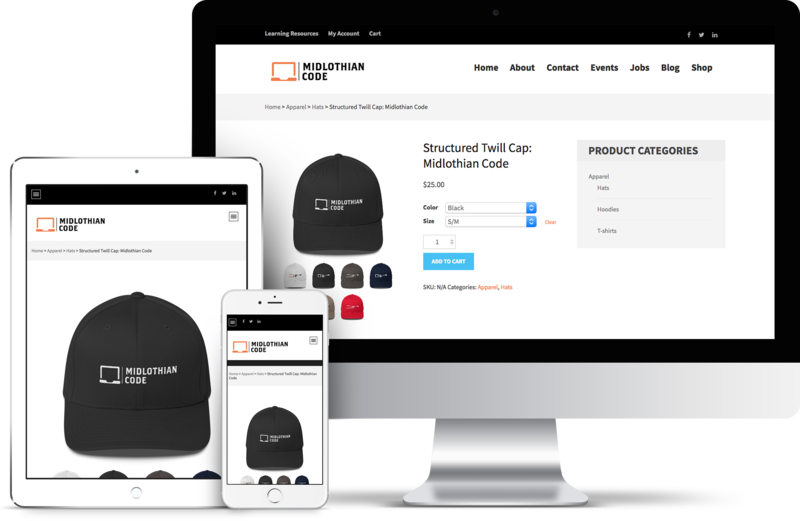 I also set up an integration with WooCommerce and Printful to allow Midlothian Code to sell things like t-shirts and hats to raise additional funding, all while using the less expensive and risky drop-shipping method. 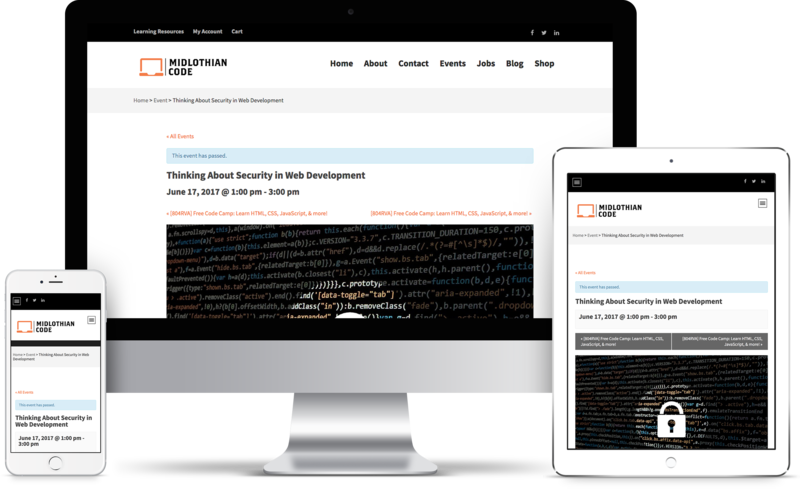 To accomplish the established goals, I created a site that used the best aspects of a CMS to keep a wealth of information in a simple, easy-to-navigate website. To prevent confusion, I customized the appearance of the integrated services to blend them more smoothly with the overall site. I also prioritized keeping the back end management as clear and simple as possible, to ensure the website could be maintained by any member of the organization’s leadership team. Creating a website that met the needs of Midlothian Code quickly and with a restrained budget took planning and effective research of reputable third-party solutions. Following the website creation, the organization noted an overwhelmingly positive response.